It can be infuriating when an anime distributor decides to cease distributing anime. You’re left with an itch that you just can’t scratch. NISA ceased licensing new anime for distribution a year or so ago, and that has left me wondering where Eccentric Family Season 2 will come from, or indeed Yuru Yuri Season 3. 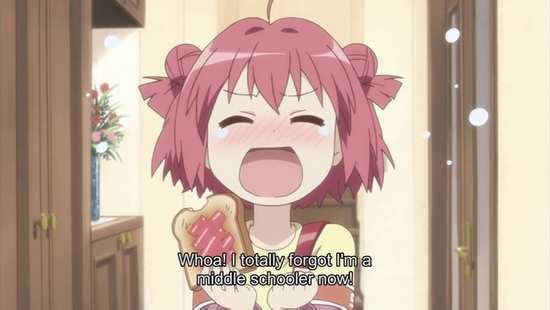 Not that I could play NISA’s release of the latter anyway, as they released Yuru Yuri seasons 1 and 2 on Region A Blu-ray only. Yuru Yuri hasn’t had a UK release obviously, so I had to go looking Down Under for a disc that I could play. And Madman have it down there, but they released it as DVD only. 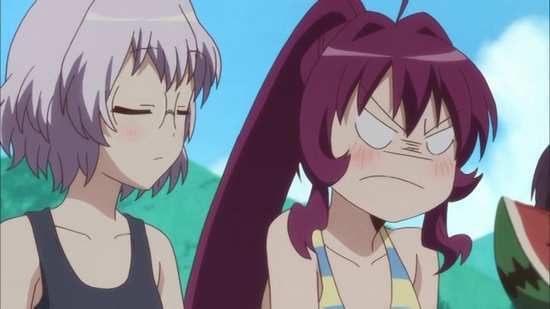 Either way, I have to hope that Crunchyroll’s licences of shows like Eccentric Family and Yuru Yuri are long term, as my tendency to watch a series through completely will lead to frustration if Season 3 of Yuru Yuri isn’t there to watch after I finish Season 2. 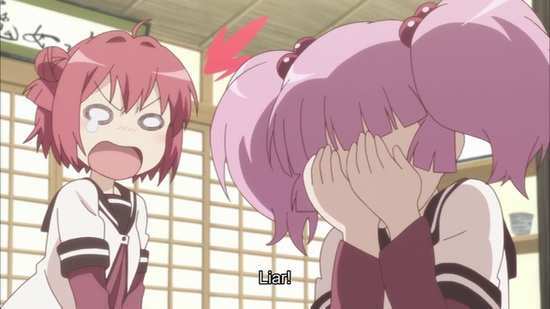 Of course, the real question is why all this fuss about Yuru Yuri? 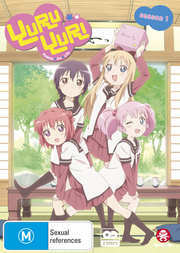 Twelve episodes of Yuru Yuri Season 1 are presented across two discs from Madman Entertainment. 3. Wanna Come Over? Yeah, Yeah! 10. What Did We Learn During Our So-Called School Trip? Yuru Yuri gets a 1.78:1 anamorphic NTSC transfer on these discs, progressively encoded by Madman Entertainment. As has been their habit of late, they’ve simply taken the NISA Blu-rays, ripped them and then encoded the episodes onto DVD, using NISA’s subtitle streams from the same, but burnt into the image. It works well enough, with the image clear and sharp, the animation smooth, and with decent levels of detail. You can’t help but wonder if the colours might have been crisper, detail levels stronger if they had encoded from genuine HD masters as used to be the case, but the show is watchable enough. 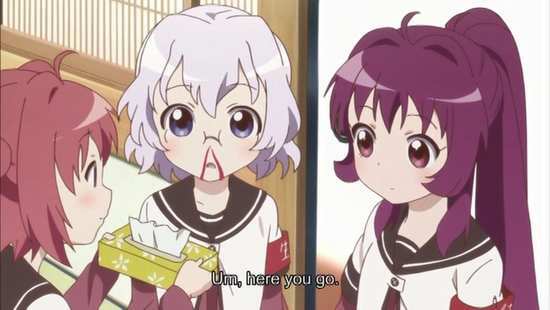 Yuru Yuri’s character designs are simple, but likeable and most importantly memorable, but the animators have free reign to let their imaginations go to work, to bring the show’s wacky and occasionally surreal humour across. This is a very inventive and creatively directed show. The disc gets a DD 2.0 Stereo Japanese track with the aforementioned burnt in subtitles, so it’s a good thing that they are accurately timed and free of typos. The dialogue is clear, and the voices suit the characters down to a tee. 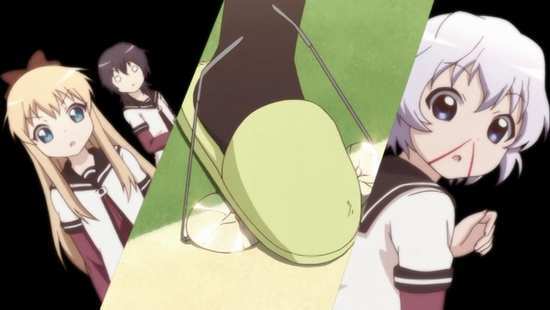 Yuru Yuri gets some nice theme tunes, and the incidental music is good as well, while the stereo brings the odd action packed moment across with clarity and a bit of separation. You get two discs in an Amaray case, with one on a central hinged panel. There’s some nice artwork on the inner sleeve featuring the eight main characters in party mode. The discs present their contents with static menus, and the episodes listed numerically. Disc 2 has the extras, and they comprise the textless credits, 2:56 of B-Side Episode Previews, and trailers for Your Lie In April, Shonen Hollywood – Holly Stage For 49, Rock Lee and his Ninja Pals, and Girlfriend Beta. The clue’s in the title if you want to know what this show is about. It’s the ‘Yuri’ bit, not a Russian name, but referring to lesbian relationships. 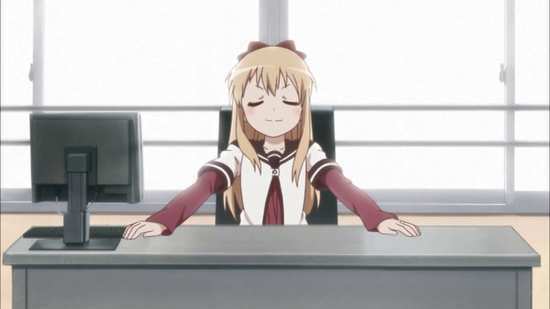 Yuru Yuri is a cute girls doing cute things series, but it’s also a cute girls lusting after other cute girls series as well, and therein lies its comedy brilliance, although given that definition, you can see that it’s solidly skewed at the male audience demographic. Not that anything explicit actually happens in the show. As has often been made clear, the comedy in anime relationships comes from the fact that they remain unrequited for the duration. It’s all about the characters, and their particular quirks. The show’s main protagonist is Akari, and she’s nothing of the sort. Her running gag is that she lacks presence, and is always worried about being sidelined and ignored. 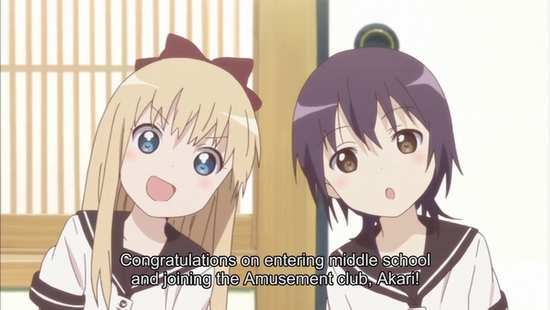 The show kicks off when she joins the Amusement Club on her first day of middle school, and is reunited with her friends Yui and Kyoko. The club membership is complete when another first year, Chinatsu joins. Kyoko’s an energetic, wacky girl, a bit of an otaku who loves a certain anime, and drawing her own manga. 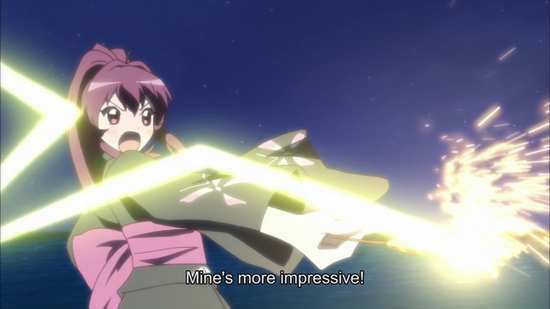 Chinatsu is a dead ringer for the anime protagonist, so Kyoko naturally falls for her in an overbearing and tactile way. So much so that Yui has to rescue Chinatsu from Kyoko’s attentions. Yui’s cool, calm, and collected at the best of times, so Chinatsu sees her as a prince charming type, and the unrequited love triangle is formed. 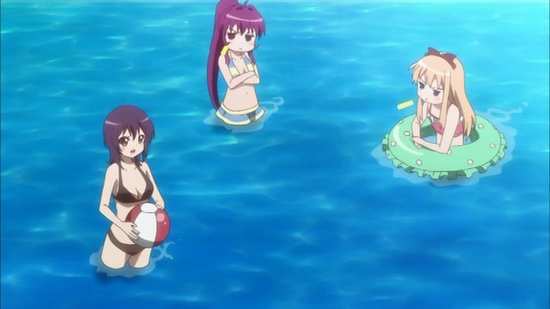 Kyoko pursues Chinatsu, Chinatsu wants Yui, and Yui tries to elegantly dodge the whole thing, which all leaves Akari like a fifth wheel. Then there is the Student Council. The vice president Ayano has a total tsundere crush on Kyoko, and because the Amusement Club is unofficial, and squatting in what used to be the Tea Club room, it offers lots of opportunity for Ayano to try and lay down the law, finding excuses to scold Kyoko just to spend more time around her. Ayano is assisted in the council by the soft spoken Chitose, who is vehemently ‘shipping Ayano x Kyoko. When she removes her glasses and focuses her imagination on what romantic situations that Ayano and Kyoko might get involved in, it usually results in violent and occasionally life-threatening nosebleeds. Two first years are also part of the student council, Sakurako and Himawari, two life-long friends, and two committed rivals. They’re always arguing and yet they are inseparable. As the show progresses, we meet a few more characters, Chitose’s twin sister Chizuru, who has her own ‘ship to vicariously obsess about, Yui’s little cousin Mari, the student council president and a dangerous science teacher. The comedy comes from the character interactions. 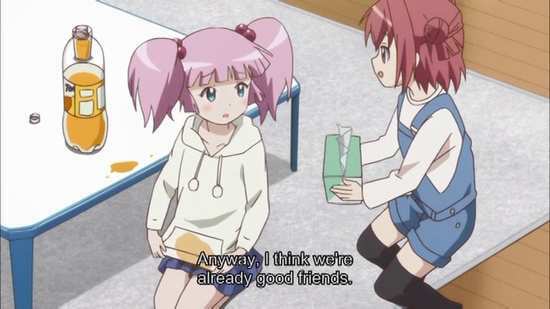 Story is less of an issue here, and Yuru Yuri is played for the wacky, the surreal, the slapstick and the daft; the silliness that friends can get up to when hanging out together. The show can also be saucy and the kind of naughtiness that skirts the edge of good taste. 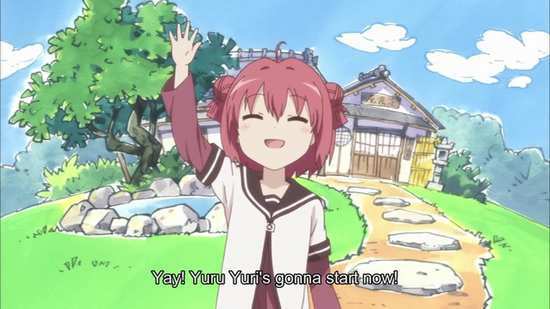 Other than a brief glimpse of Akari’s sister’s bedroom (she has an uncomfortable obsession with her younger sister), Yuru Yuri is good clean-ish fun. The show takes us through a year of middle school, exams, the school trip, summer holidays, Christmas and April Fools all of which offers a great variety of comic situations. 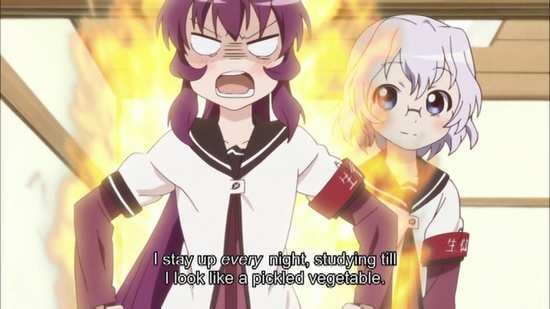 Yuru Yuri makes me laugh, constantly. The characters are fantastic, and the saucy silliness they get up to is hilarious. It’s a shame that it hasn’t had more extensive distribution, as I would have loved to have seen it released in the UK, especially on Blu-ray. As it is, we’re left with trying to snaffle up NISA’s Region A locked Blu-rays before they go out of print, or Madman’s DVDs, which are of decent quality, but don’t show the series in the best light. If you have a Crunchyroll subscription, that might be the preferred option to watch this show.